Penicillium colonies range in colour from blue-green to white, yellow and pink with a velvety or powdery texture. They grow rapidly and release a strong musty odour. Penicillium was discovered in 1928 by Dr. Alexander Fleming, who was a bacteriologist at St. Mary’s Hospital in London, England. 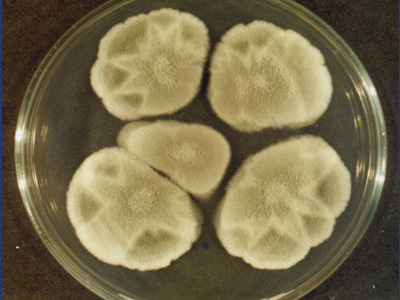 (5) After examining colonies of Straphylococcus aureus, Dr. Fleming found that a mold known as Penicillium notatum had prevented the normal growth of Staphylococcus in his petri dishes. In addition, he discovered that there was some factor present in Penicillium mold that, apart from inhibiting bacterial growth, might also be used to combat infectious diseases. At that time, no specified medications for bacterial infections existed, and many people developed blood poisoning. In addition to being the first person to suggest that Penicillium mold is capable of secreting an antibacterial substance, Dr. Fleming was also the first person to develop a concentrate of the active substance, penicillin, in 1928. A lot of research was conducted over the next twelve years, during which he grew and distributed the original mold. However, Dr. Fleming wasn’t the first person to use the properties of Penicillium in medicine. Other people involved in the mass production of penicillin included Ernst Chain, Edward Abraham, Howard Florey and Norman Heatle. Penicillin was introduced as an antibiotic in the 1940s, and since then, it has been recognized as one of the greatest advances in therapeutic medicine. Its discovery, as well as the first recognition of Penicillium’s therapeutic potential, happened in the United Kingdom. The United States also played a significant role in the large-scale production of Penicillium during World War II, thereby making the life-saving substance that was once in limited supply widely available. There are over 300 accepted species of Penicillium. They are commonly referred to as either the blue or green molds due to the fact that they produce many quantities of bluish, greenish or yellowish spores that give them their aforementioned characteristic colours. Penicillium refers to a group of molds that share the same characteristics and can be found all over the world. It was Penicillium mold that was responsible for saving many lives by producing the first known modern antibiotic known as penicillin. The discovery of Penicillium by Dr. Fleming from the fungus P. chrysogenum (then known as P. Notatum) greatly perfected the treatment of infections caused by bacteria. The name Penicillium was derived from the fact that the spore-producing structures of the fungus (conidiophores) had a close resemble to a paintbrush. The word penicillus is Latin for paintbrush. (8) Often, Penicillium molds are found in decaying vegetation, soil and air. They tend to be common contaminants of many substances. Where can Penicillium be found? Penicillium can be found practically anywhere, from air and soil to our homes. It can also contaminate leather goods and other textiles, and is a strong indicator of indoor moisture issues. 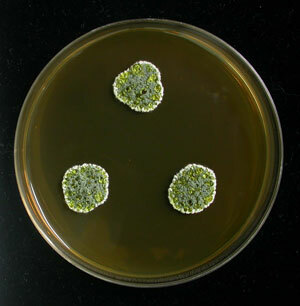 Like all molds, Penicillium can develop whereever there is moisture and a temperature that is conducive for its growth. A good example is how Penicillium was discovered. Since Penicillium molds can cause food spoilage, they also present a health hazard when consumed. This is because some species of Penicillium produce toxic compounds known as mycotoxins. (9) These toxins make food inedible and dangerous. It is therefore better to be safe than sorry, and to discard any food items that show signs of mold growth. Penicillium spores can trigger allergic reactions in individuals who are sensitive to mold. As such, the health of the building’s occupants can be adversely affected if the indoor environment contains high concentrations of Penicillium. 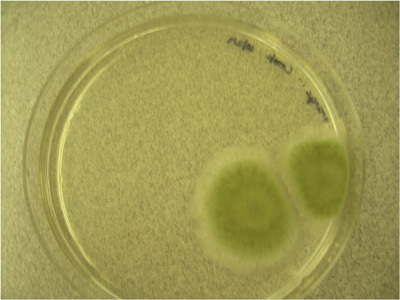 However, some Penicillium species are beneficial to humans. A good example is cheese like Brie, Stilton, Roquefort and Camembert, which are ripened using Penicillium species and are safe to eat. (10) Another example, as mentioned earlier, is the penicillin drug, produced by P. chrysogenum, which is frequently found in many households. What are safe levels of Penicillium? Penicillium molds feed off of water, humidity or any other type of moisture. Over the years, a great deal of effort has been put into establishing standards for safe levels of mold spores in indoor residential environments. Unfortunately, there has yet to be a consensus since every species of mold presents a different set of health risks. The best way to determine whether or not you have high concentrations of Penicillium in your house is to compare an indoor sample of air with an outdoor air sample. If there is not much difference between the two results, your indoor air is likely good. However, if there are drastically more Pencillium spores indoors than there are outdoors, you definitely have a mold or air quality problem that needs to be addressed. Please note that a lack of proper air circulation and insufficient ventilation only make the problem worse and can lead to unsafe levels of Penicillium mold in your home. What are the allergy symptoms associated with Penicillium mold? Since Penicillium molds are fungi, their tiny spores can become airborne easily and linger in the air without us knowing it. And because we all need to breathe, we are likely to inhale these spores if there is a mold contamination in our home. How each person reacts to the inhalation of Penicillium mold spores is unique. Some individuals may experience asthma symptoms or allergic reactions, while others may not feel anything. If you do have an allergy to Penicillium, your immune system’s response will be to trigger symptoms like itchy and watery eyes, sneezing, nasal congestion, itchy lips, mouth and nose, or a runny nose. However, there are thousands of species of mold, and not all of them cause allergic reactions. The most common types of mold that cause allergies include Aspergillus, Penicillium, Alternaria and Cladosporium. What are the health effects of Penicillium mold? Despite Penicillium having a number of beneficial properties and uses, exposure to this mold is not good for human health. When we inhale mold spores into our lungs, we become vulnerable to respiratory problems such as coughing, shortness of breath, chronic sinusitis, sneezing and a runny nose. Some people may also experience rashes or hives as well as swelling in the throat, which can be a life-threatening reaction known as anaphylaxis. 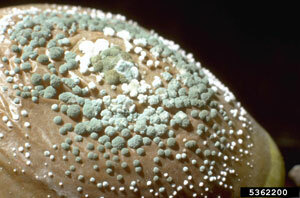 Furthermore, some mold species may produce mycotoxins, leading to damage to your internal organs. If you are experiencing any of the above-mentioned symptoms and you suspect that mold is the cause, it’s advisable to see your doctor. How to remove Penicillium mold? Without a doubt, any identified mold should be removed from your home—the sooner the better. Many molds are harmful to human health, especially to infants, those with respiratory conditions such as asthma, elderly people as well as those with poorly functioning immune systems. To protect your health as well as the health of your family, removing mold from your indoor environment quickly and effectively is essential. When cleaning mold, you should avoid exposing yourself to mold spores and mycotoxins. This is the reason why many homeowners make the decision to hire a mold removal professional to safely eliminate the mold problem. However, if you choose to do the mold removal work yourself, you must protect yourself with the appropriate safety equipment and follow established containment, remediation and waste disposal procedures. How to prevent Penicillium mold from growing back? Once you have removed all Penicillium molds from your home, you need to prevent them from growing back. Since mold spores are often airborne, your home should be well ventilated with plenty of air exchange. This will reduce dampness and humidity, which is the key factor in any mold contamination. No matter what, always try to give your home plenty of fresh air and sunlight. Using an air purifier and/or dehumidifier will also help reduce the relative humidity inside your home. For stubborn mold problems that persist despite your best efforts to ventilate and reduce humidity and moisture in your home, you should contact a mold removal professional. At Mold Busters, our diagnostic mold inspections and visual assessments often reveal hidden moisture problems that contribute to ongoing mold contamination and decreased indoor air quality inside of homes. Call us today to book your mold inspection. Picture of P. glanicola found on site, visited 3/20/2019.